Horseshoe diamond and sapphires ring. Great gift idea for the horse lover in your family. If you like horseshoes or just looking for a little extra luck. How about this handcrafted Horseshoe diamond and sapphires ring perfect for everyday wear and tear. Add some lucky bling for the ring!! Dimensions: 8mm wide on top of ring tapering down to a 2mm shank. Available in 14kt white and 14kt yellow gold. 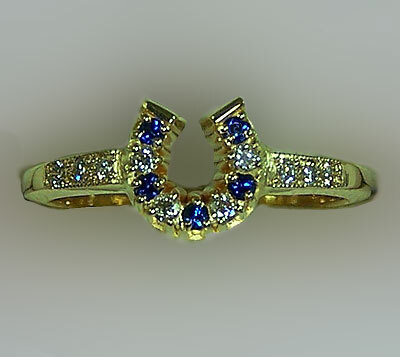 This Horseshoe ring is set with .21ct of matching diamonds and genuine sapphires handcrafted out 14kt yellow gold. Would you like to design you own? Now you can request your birthstone or anything you like to make this design special for you.